Heart disease does not simply sneak up on a person. There are a number of lifestyle choices and medical conditions that can lead someone to develop heart disease, with some symptoms going completely undetected until it’s too late. The real tragedy behind the staggering number of deaths caused by heart disease is that they are often preventable. Unfortunately, hundreds of thousands of Americans increase their risk of acquiring these deadly conditions simply by forgetting or neglecting to focus on their heart health on a daily basis. To help raise awareness regarding the dangers of heart disease, February has been named American Heart Month. By working together to educate our community on the facts and prevention techniques surrounding this disease, we can encourage others to make healthier choices to reduce their risk and improve the quality of life for Americans for generations to come. Here are just a few of the ways you can participate in American Heart Month this year. The best way to begin spreading awareness regarding heart health is to know the facts. Heart disease, as defined by the Mayo Clinic, is a range of conditions that could negatively affect your heart. The most common causes of heart disease are high cholesterol, high blood pressure, diabetes, obesity, and smoking, as well as a lack of physical activity. Though heart disease can be traced back as far as the ancient Egyptians, a recent rise in poor lifestyle changes over the past century has skyrocketed the number of Americans who suffer from it. Coronary artery disease is the most deadly form of heart disease in our country, contributing to over 370,000 deaths every year. Coronary heart conditions involve the narrowing of the blood vessels and blockages of blood flow to the heart, which lead to two of the most fatal health conditions: heart attacks and strokes. The CDC reports at least 735,000 Americans have a heart attack every year. Of these reports, around 525,000 of the patients were suffering from their first heart attack, while 210,000 of the patients have had at least one prior. For a long time, people believed that heart attacks were only felt on the left side of the chest and in the left arm. This depiction (popularized by Hollywood films) has been proven wrong time and again, resulting in a number of deaths from people unaware they were experiencing a heart attack or who did not seek medical treatment soon enough. Uncommon heart attack symptoms are not just unique to men or women. In fact, the more health experts are learning about heart attacks from patients who have survived them, the more they are discovering that most people are looking for the wrong signs regardless of their gender. An article published in Men’s Health highlighted six heart attack survivors reporting various signs they experienced before their heart attacks. The men’s symptoms were so easy to pass off as other conditions, they never associated them with a heart attack until after the fact: feeling fatigued doing everyday things, tricep and neck pain, flu symptoms, and chest burning sensations for months. 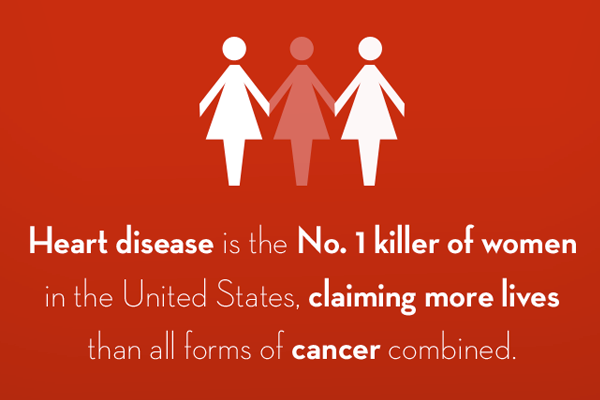 Heart disease is the number one killer of women, and most of them show no prior symptoms. A Harvard study comparing heart disease in men and women showed women were more likely to die from heart disease than men due to later detections. The study showed women are more likely to experience fatal blockages in the tiny vessels of the heart rather than the larger ones, so they are harder to detect before a heart attack occurs. The study showed that even though men do experience atypical heart attack symptoms, women are more likely present with them. Some women are even at risk for what is called ‘broken heart syndrome’, a condition where the heart is subject to sudden and unusual changes in the shape caused by severe emotional stress! National Wear Red Day on February 1st specifically addresses the need to spread awareness about the unique ways that heart disease affects women. You can join millions across the country in standing up for women’s heart health and commit to fighting back against heart disease in your community by wearing your best red attire and speaking out about this worthy cause. Certain cases of CHD’s are still puzzling, possibly linked back to gene mutations or chromosomal abnormalities during development. Other cases of CHD can be traced back to more preventable factors, such as smoking during pregnancy, the mother’s diet, the mother’s health conditions such as obesity and diabetes, and using certain medications during pregnancy. Rock Your Scar 2019: This empowering photo contest encourages those who have been affected by congenital heart disease to use hashtag #RockYourScar2019 and post photos of their journey to recovery. Roar N Run 2019: This virtual marathon is aimed to raise awareness about CHD by sharing the miles you run for the cause by using hashtag #RoarNRun2019. Remember Our Hearts 2019: Mended Hearts will be hosting a candlelight visual that viewers can follow on social media in honor of all the innocent lives that have been lost due to CHD. Anyone who has a photo of a loved one they would like to share can use #RememberourHearts. For more information on how to get involved in spreading awareness regarding congenital heart health, visit MendedHearts.org. It doesn’t take much to reduce your risk of heart disease and some of the changes are easy to incorporate into your everyday lifestyle. The American Heart Association reports a lack of commitment to focus on a heart-healthy lifestyle is the biggest contributor to the soaring death rate we are seeing around the world from this disease. The Greater Baltimore Chapter of the American Heart Association is dedicated to creating a world free of heart disease and stroke. By coming together as a community, we can all do our part to raise awareness and make better lifestyle choices to reduce the effects of heart disease for current and future generations. To get involved in your community, visit Heart.orgfor the Greater Baltimore region to attend an event in your area or find out more information on how to make your heart happier and healthier this year.